Fat on the sides of the knees is far away from the vital organs, which makes it harmless from a health perspective. The problem sets in when you wear shorts or outfits that reveal this adipose tissue. Instant feelings of self-consciousness have a tendency to crop up in this case, which can leave you frustrated. Losing this fat is not complicated, but you do need to have discipline. While it's not possible to spot reduce, a solid workout plan coupled with dietary changes allows you to burn excess fat from all over your body. Toning and tightening the muscles found near the knees will give you a leaner look as you lose weight. Exercise at low to moderate intensity for 30 or more minutes, five days a week, to burn fat in the knees and body. This intensity level encourages your body to burn fat rather than just carbohydrates. You will know you are at low to moderate intensity when you reach 50 to 70 percent of your maximum heart rate or when you can talk without much effort while exercising. Do any cardiovascular exercise that you enjoy such as brisk walking, jumping rope or jogging on a treadmill. Restrict your intake of calorie-dense beverages. Soda, beer, wine, slushies, sweetened teas and processed fruit punch all have a high amount of calories that often get overlooked when weight loss is an issue. Replace all of these drinks with water and diet beverages to further promote fat loss on the sides of your knees. Weight train or use your body weight to strengthen the muscles around the knees such as the hamstrings and quadriceps. Although this won’t technically burn knee fat, it will help improve their appearance. 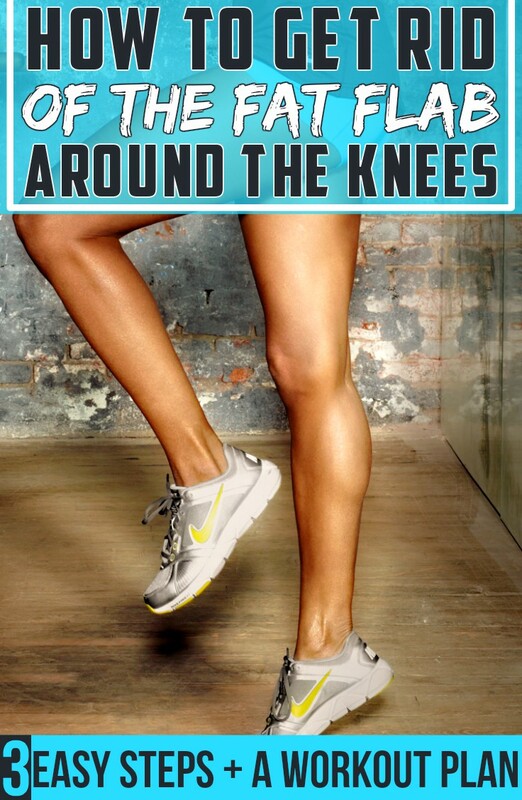 Exercises that target the knee area include single leg squats, leg presses and dumbbell side lunges. Or do the stiff-legged barbell deadlift by holding a barbell or set of dumbbells in your hands, bending your knees and lowering the weight toward your feet. Return to the starting position and repeat for a total of 12 to 15 repetitions. Do another set if possible. An example of targeted strengthening exercises that can help tone your legs while consistent aerobic exercise can help fight fat on all areas of your body. To perform a lunge, grasp a dumbbell in each hand to increase muscular strength in your legs. While in a shoulder-width stance, straighten your back, tighten your abs and face forward. Step about 2 feet forward with one foot, and bend both knees until your legs form a 90-degree angle. Don't allow your hind knee to touch the floor, or your front knee to go out farther than your toes. Hold this position for one count and return to the original position. Repeat the lunge with your other leg. Perform 10 lunges with each foot for three total sets. Stand with your feet hip-width apart with your back straight and your abdominal muscles tight. Looking forward, bend at your knees and force your buttocks out behind you. Continue squatting until your thighs are almost parallel to the ground. Hold this position for one count before returning to your original position. To create an advanced version of this exercise, hold a barbell behind your head and rest it on your shoulders or hold a dumbbell in each hand at shoulder height. Perform three sets of 10 repetitions. Perform leg extensions on a leg extension machine at a local fitness facility or perform this exercise with a dumbbell at home. To perform a dumbbell leg extension, sit on the edge of a chair with your knees bent, back straight and abdominal muscles tight. Hold the dumbbell between your feet with a firm grip. Slowly raise your bent knees straight up into the air and straighten your legs out in front of you. Slowly bend at the knees to return to the original position. Perform three sets of 10 repetitions of this exercise.